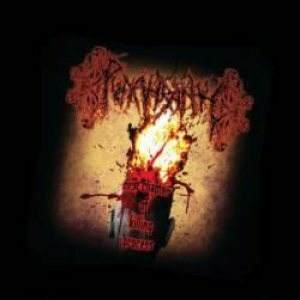 RANDOM: PUNAHRANAH "First Chapter Of Killing Process"
This is some very good Malaysian death grind, believe me. Instantly attracted to the band name, the material impressed me even more. This self-released material lasted slightly below the 15 minutes mark, and I found myself listening to it 5 times in a row. "First Chapter Of Killing Process" recalls the early years of ABORTED to me, the impact is pretty much the same to my limited listening experience. PUNAHRANAH does their stuff immensely at ease and exuberated an air of confident and flair. They certainly breathe the Metal that they play, evidence that evaporated from this release. Everything is perfectly executed here, at least at the time of the recording. They seemed to be more than ready when getting this recorded. Highly interesting Malaysian death grind release for quite some time, I bet on that. Unfortunately my copy suffers from uneven levelling of the sound, not sure if every copy is affected by this as well. And I'm not sure about the limitation of this demo too, so if you have the chance, I can only advise you to keep it. The first chapter is (almost) flawless, I'm eager to hear more.